Ford's return to the world of motorsports could only have been achieved with a world-class performance car. Anything less would not properly represent the staggering developments the manufacturer has made in vehicle design. The new GT exceeds even the highest expectations for racing prowess and engineering. Naturally, inspiration for the next-generation model comes from the classic Ford GT40. Still admired as one of the finest racing cars of all time, the GT40 set new benchmarks for what Ford cars could accomplish. At first, the model was simply called the Ford GT. The 40 in the name is rumoured to refer to the 40-inch height of the initial design. One of the original GT40 models is currently being restored. The original car took first place in the 24 Hours of Le Mans endurance race back in 1966. It was a significant victory for Henry Ford, finally showing that Ford cars were capable of beating their Ferrari rivals. The win was also the first of four consecutive victories by the GT40 at the track. The GT's return to the world of endurance racing was first announced in late 2015. We initially saw what the car would eventually become at the Detroit Motor Show that same year. The timing of the announcement and the newest GT is undeniably significant. This year marks 50 years since that legendary GT40 win. Ford's motorsports comeback is far more than a celebration of the anniversary. The most appropriate way to recognise the achievements of the original car and the advances made since will be to win. Incredible aerodynamic design grants the car a futuristic appearance – as do the smooth gullwing doors. The two-door body is carefully streamlined, with vast air intakes at the bonnet and a prominent rear spoiler. It feels born for the circuit. Racing livery and sponsor branding complete the look. Several GT models are set to compete at the FIA World Endurance Championship, and the season begins at Silverstone in early April. This means the supercar will appear at Le Mans – the most appropriate place to stage a comeback in style. The race in France is considered the highlight of the season. Ford has named four highly experienced drivers to take control of the new GT during the season. They will represent the UK team, and be joined by the American team for certain events. Marino Francitti, Andy Priaulx, Olivier Pla and Stefan Mücke all have a considerable number of race wins to their names. A 3.5-litre EcoBoost V6 petrol engine creates unrelenting power. It has a smaller capacity than the 4.7-litre engines the GT40 stormed to victory with. This is an advantage – the lighter build packs more strength and economy into a more compact space. Trademark Ford efficiency gives the GT impressive stamina, something vital for 24-hour racing. The Ford EcoBoost engine has won multiple awards over the years so it comes as no surprise that even in Ford's latest supercar it has been featured. 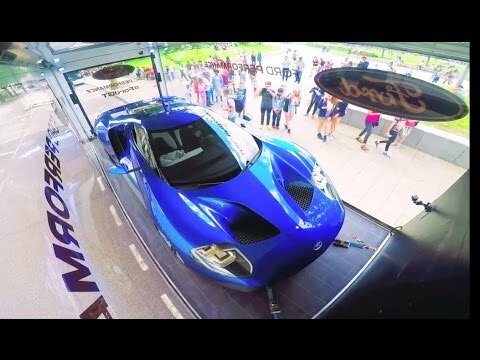 To catch a glimpse of the Ford GT, you will need to be quick. It roars past crowds and admirers with confidence. Visitors to the 24 Hours of Le Mans on June 5, 18 and 19 2016 will have the chance to spot the vehicle. The UK and US will together field four cars at Le Mans in the GTE class. Applications to own the new Ford GT have yet to open. It is expected that only around 250 road-ready versions of the supercar will be built each year. Keep checking back for the latest information. For more information on the new Ford GT, contact your nearest Birchwood Ford showroom today.